There’s no consensus top quarterback in the draft class, though as many as six signal-callers have had at least some level of first-round hype. From productive quarterbacks, to high-upside guys, to quarterbacks with incredible running ability and questions in the pass game, this class has it all and there will be plenty of drama, and perhaps movement, with so many QB-needy teams around the league. 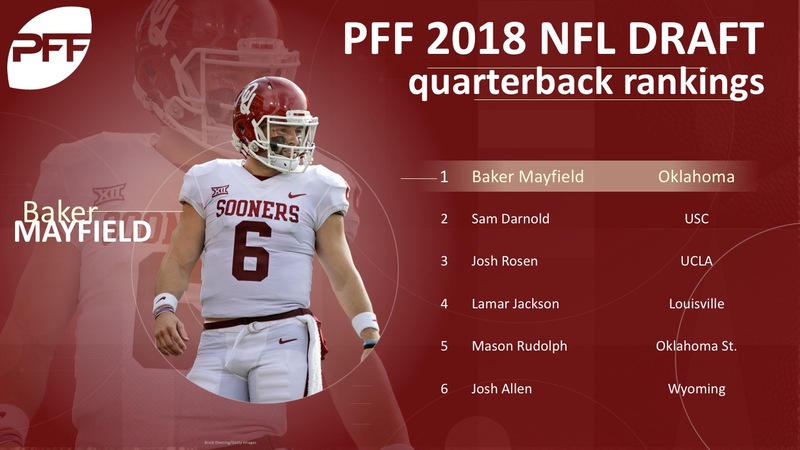 Here’s a look at PFF’s quarterback rankings that encapsulates our grading of every snap dating back to 2014 as well as a deeper dive into film study on each player. From a pure production standpoint, Mayfield has been in another class, and he has the necessary NFL tools despite questions about his height. He owns the two top PFF grades since 2014 and he possesses the arm, accuracy and playmaking ability to be the best quarterback in the class. Mayfield has posted the lowest percentage of negatively graded throws in the nation for two straight years and he led the draft class in big-time throw percentage last season, showing he has what it takes to create big plays down the field.